99-kilometer coastal highway from Tagbilaran to Anda to echo the global call of the people’s pilgrimage for 100% clean energy. The 3-day pilgrimage dubbed Bagtas Lunhaw: Bohol Climate Walk 2015 will begin in Kilometer 0 at the Tagbilaran Plaza Rizal on November 27 at 3 o’clock in the afternoon. They will have a sleepover stop in Loay on the first day, and in Garcia Hernandez on Day 2, November 28. Midday breaks are pinned in Dimiao and Duero, on the 1st and 2nd day, respectively. Brown bag sessions on climate crisis, the climate talks and papal encyclical Laudato Si will be held along the way. 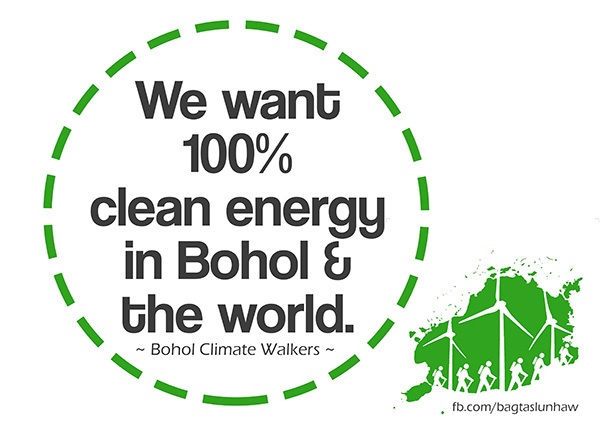 Tagbilaran City – Some 20 Boholano environmental activists are taking a 99-kilometer journey on foot, from Tagbilaran City to Anda, Bohol on the November 27-29, 2015 to call for 100% Clean Energy and walk in solidarity with the People's Pilgrimage to the Paris climate talks. The pilgrimage which the group calls Bagtas Lunhaw: Bohol Climate Walk 2015, will begin in Kilometer 0 at the Tagbilaran Plaza Rizal on November 27 at 3 o’clock in the afternoon. They will have a sleepover stop in Loay on the first day, and in Garcia Hernandez on Day 2, November 28. Midday breaks are pinned in Dimiao and Duero, on the 1st and 2nd day, respectively. Brown bag sessions on climate crisis, the climate talks and papal encyclical Laudato Si will be held along the way. 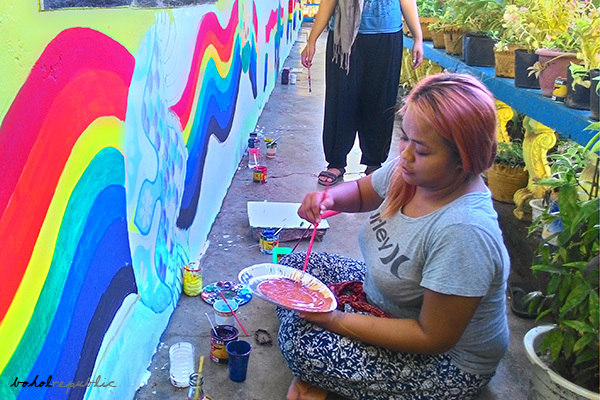 On November 7, 2015, the school buildings of Ubujan Elementary School in Tagbilaran became a canvas for a mural project initiated by its school principal Mrs. Evangeline I. Canda. In an effort to bring more inspiration into the school environment, and inspired by a recent visit to a school in Negros festooned with wall paintings, Mrs. Canda sought out local artists to help bring into fruition her vision of a similar splash of color and creativity into her school. This is, in addition to existing school improvement programs in Ubujan Elementary School (ES) such as Bio or Green Parks, Gulayan sa Paaralan, Waste Segregation and the like.